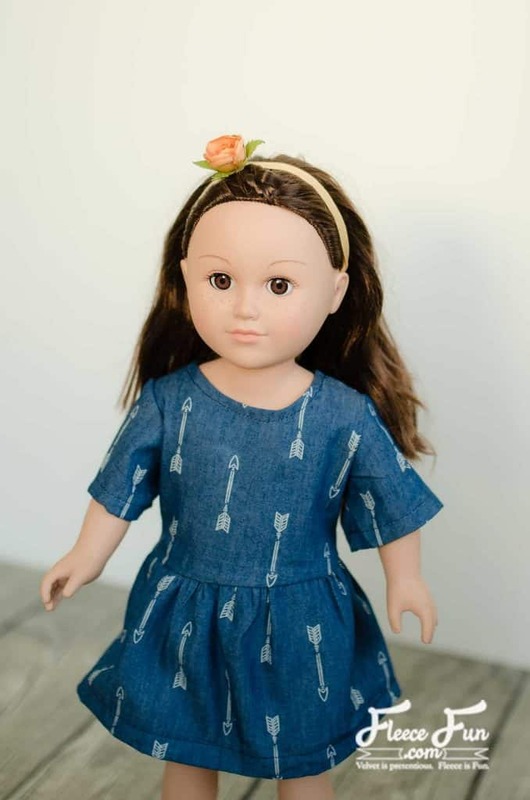 This Chambray Party Dress for 18″ Doll Free Pattern tutorial is perfect for your American Girl Doll. 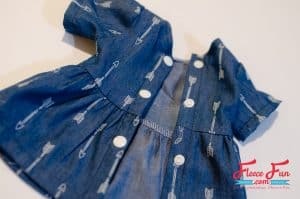 Cute and with step by step instructions this free sewing pattern makes for a cute dress for dolly. fat quarter (1/4 yard) light to medium weight woven fabric. 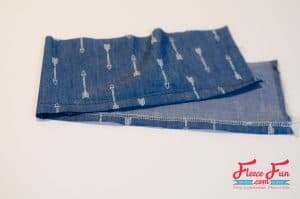 Chambray is a very lightweight denim. Cut 1 front on fold, 2 back, and 2 sleeves. Also cut a rectangle 5.5″ x 24″ for the skirt. 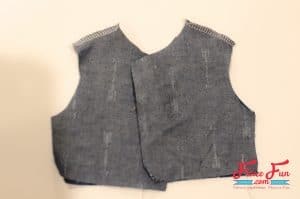 With right sides facing, sew fronts to back at shoulder seams. 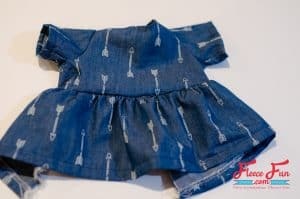 Finish off neckline edge with zigzag or serger. Press to wrong side by 1/4″ and stitch. 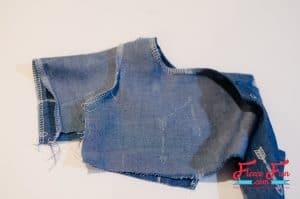 Finish sleeve edge with zigzag or serger. Press to wrong side by 1/2″. 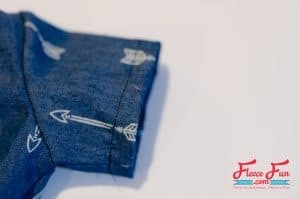 Sew sleeve into armscye, right sides facing. 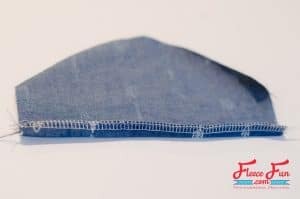 Topstitch sleeve hem 3/8″ from the folded edge. 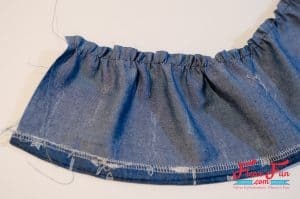 Finish one long edge of the skirt with a zigzag or serger. Press to wrong side by 1/2″. Topstitch hem in place. With a long basting stitch, gather other long edge of the skirt panel. 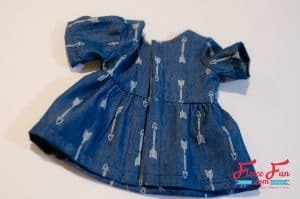 Pull the bobbin thread to gather the skirt so that it is the same width as the lower edge of the dress bodice. Stitch skirt to bodice, right sides facing, with a 1/2″ seam allowance. Remove basting stitches. 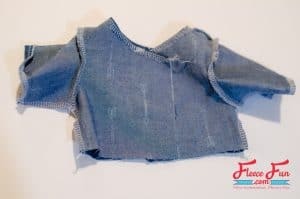 Finish raw edge with serger or zigzag. Press seam allowance up. 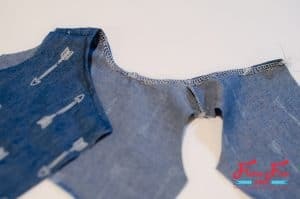 Cut 3/4″ wide strips of interfacing and apply interfacing to the wrong side of the center back edges. Press edges to the wrong side by 3/4″. Topstitch in place. Apply snaps, buttons, or Velcro as desired.